Fat loading to lean out sounds contradictory, but it may not be. 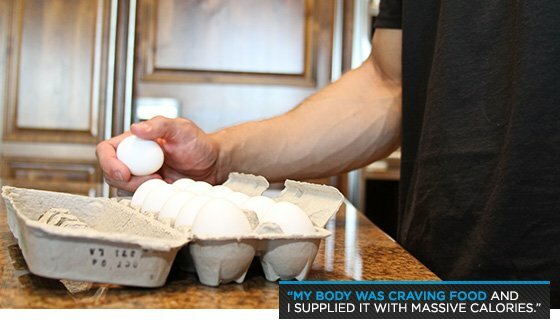 Learn how I consumed 6,400 calories in a day—en route to getting ripped. When it comes to weight-loss tips, conventional wisdom almost always boils down to "calories in, calories out." That mindset might be popular, but it doesn't always work, and it's definitely not the only answer. I know this because I've been the guinea pig for multiple diet protocols. One of the most successful "diets" I've been on called for more than 6,000 calories. This physiological science experiment showed me that losing body fat can occur because of hormonal reactions to food. 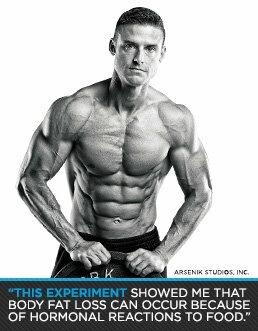 I began this experiment after 12 weeks of dieting for a competition. After dieting hard for so long, I take a night to celebrate. That celebration always includes copious amounts of food—I eat whatever I want! The result of this mega-meal is always a ridiculous hormone response that leaves me in crazy growth mode. I wanted to see if I could achieve this reaction on a weekly basis so I dug into The Anabolic Solution for Power Lifters by Dr. Mauro Di Pasquale. I've always loved the ideas behind the anabolic diet. I like keeping my fats high and my carbs low during the week; I then throw in some extra carbs on the weekends. I'm sensitive to carbohydrates. In order to get my body fat low enough for competition, I have to go with a low amount of carbs for a long time. Carb cycling doesn't work for me. So, I took some ideas from Dr. Di Pasquale's book and teamed up with my mentor Dr. Eric Serrano to come up with a crazy idea: fat loading. It may sound strange, but just bear with me for a moment. 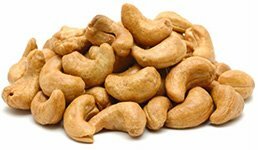 Instead of cycling carbs, I increased my fat intake every third day. Those fat-load days were always amazing. My body responded even better than I thought it would. I got incredibly dry and insanely vascular. I could definitely feel a bump in my testosterone, helped in part by adding 6-10 grams of BCAAs every meal. After sticking with this plan for a few weeks, I woke up one day at 176 pounds. I was lean and looking pretty legit. But I was hungry as hell and I needed something more than just my fat-loading day. So I called Dr. Serrano and asked him what would happen if I ate as much fat as possible. "Do it and see what happens," he said. Actually, it was a bit more complicated than that. He said if my calories were high enough, they would make an anabolic environment. My interest was immediately piqued. I went for it. Keep in mind that I was already lean. My body was primed for something extreme. And, yes, this was extreme, but it was time to see what I could do. I went to train during that day looking unbelievable. People were coming up to me left and right, asking me what I was eating. My pump was out of this world during the entire workout and despite the mass surplus in calories, I stayed vascular and dry. I woke up the next day and stepped on the scale. It read 172. I was harder, leaner, and down four pounds after eating 6,400 calories the day before. What in the world was going on? To put it simply, I took advantage of my hormonal reaction to nutrient timing. My body was craving food and I supplied it with massive calories. In turn, my body rewarded me with some incredible results. As a natural guy, I've always looked to challenge my body to elicit a drug-free anabolic reaction. These extra calories provided it. This isn't the meal plan for a day-to-day diet, but if you use it correctly, an incredible anabolic reaction and weight loss could be in the cards. That is your 6,400-calorie answer.